If your Porsche requires Service, or general maintenance work, please contact us, either by email or by phone to discuss your requirements. Our dedicated team of engineers have great depth of experience, not only with Porsche cars, but also in the wider sphere of automotive engineering. We are all experienced in the field of preparation and ongoing maintenance of competition cars, with most of our staff having personal competition experience . 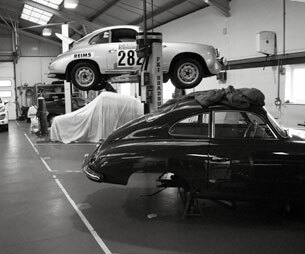 Our experience in the field of Porsche restoration is second to none. These skills and base knowledge are transferred and utilised even in the more basic servicing operations. 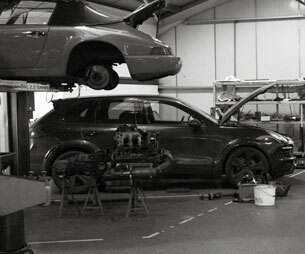 We work to the very highest standards, and have at our disposal excellent facilities, including spacious well equipped workshops with full diagnostic equipment and air conditioning service rig, engine and transmission build bays, machine shop, and bodyshop with full Celette chassis jig facility. Whether your needs are straightforward or of a more complex nature, our knowledgeable, multi-talented staff are ready to assist you with advice or information. We are able to offer all mechanical and electrical services, including engine rebuilds, transmission rebuilds, and fabrication of bespoke wiring looms. 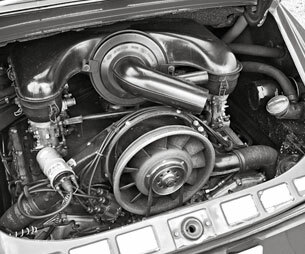 We are able to provide all motorsport and development services for Porsche cars and other marques.